Sir Hugh Casson (1910-1999) was an artist, architect, interior designer, writer and broadcaster. After a posting with the Camouflage Service of the Air Ministry during WWII, Sir Hugh leapt to prominence as Director of Architecture for the Festival of Britain, at the age of just 38. The festival was a great success, and he was knighted for his efforts. An outstanding writer, broadcaster and speaker, he presented a number of television series on architectural subjects. He enjoyed designing sets for the theatre and had a long and happy collaboration with Glyndebourne Festival Opera; he also created and ran the school of Interior Design at the Royal College of Art, and also designed interiors for the Royal Yacht Britannia, for Buckingham Palace, Balmoral and Windsor Castle. Sir Hugh’s career was crowned in 1976 by his election as President of the Royal Academy of Arts. He held this prestigious post for eight years, and his many accomplishments there included the creation of the Friends of the Royal Academy, an organisation which set the benchmark for cultural institutions. 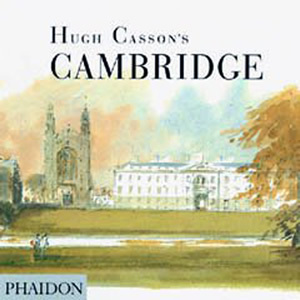 Sir Hugh was also an accomplished watercolorist, and his books Hugh Casson’s Cambridge, Hugh Casson’s Oxford, and Hugh Casson’s London are a testament to this talent. His work has a dedicated following and remains increasingly sought after. He was happily married for sixty years to the architect, designer and photographer, Margaret Macdonald.